Make a little effort for big flavour. This burger has built-in barbecue sauce and a grilled onion topping. Shape meat into 4 patties. Brush onion slices with 2 Tbsp. dressing. Grill patties and onions 5 min. on each side or until burgers are done (160°F) and onions are crisp-tender, brushing onions occasionally with remaining dressing and brushing burgers with barbecue sauce. 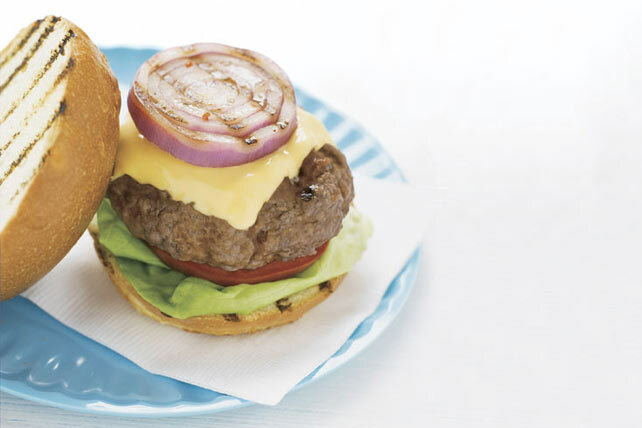 Top each burger with Singles; grill 1 to 2 min. or until Singles begin to melt. Meanwhile, place buns, cut-sides down, on barbecue. Grill until toasted. Fill buns with lettuce, tomatoes, cheeseburgers and onions. Insert 4 metal or soaked wooden skewers completely through the whole onion at 1/2-inch intervals. Cut onion into 4 thick slices. The skewers will help keep the slices intact while grilling. Cook 4 bacon slices; cut in half. Add to buns with remaining ingredients. Thank you. We heard your feedback and retested this recipe. We adjusted the preparation to eliminate the issue some of you experienced. Please follow this updated recipe. Thank you for your input.